The Zambia is rapidly degenerating into a police state. Numerous citizens are detained in police stations without regard to their rights under the constitution. This has become commonplace as regular reports of beatings, torture and deaths in police custody seldom seem to elicit outrage. 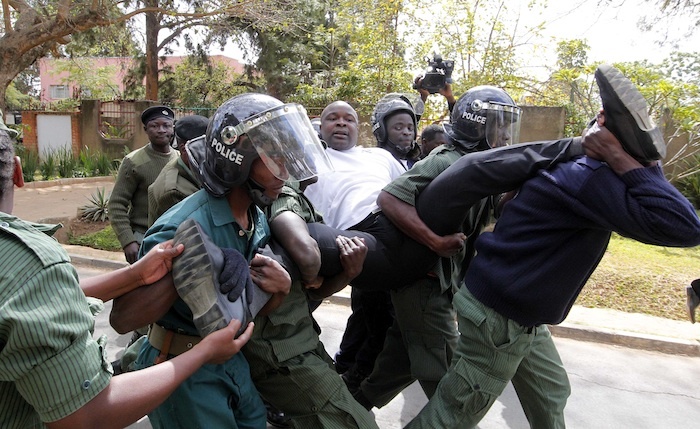 Zambians are becoming immune to the routine reports of police brutality. The Public Order Act is abused by the police and has become an instrument of oppression rather than policing. The police arrogantly assert that only their interpretation of the act is valid. The constant show of and use of excessive force by the police is intended to create a climate of fear and obedience in the general population. Benefactors of the system align themselves with these instruments of fear and defend the police and show scant concern for the victims of police brutality and those whose rights are trampled upon by the police. If one had any doubts about Zambia’s slide into a police state, two recent events clearly debunk the doubt. A few weeks ago, Mark Nchimunya Choonga, was brutally killed in police custody. To begin with, the late Choongwa should never have been in police custody. How does one end up in police custody after a minor traffic accident? There has been no public condemnation of the police on this matter by the leadership and no one has been punished for the illegal detention of Choongwa. Unashamedly, the police have been allowed to carry out what is clearly a cover up. Yesterday, the second event gave evidence of the degenerative slide towards a police state. Heavily armed police attacked Hakainde Hichilema and his family in their home. Before the attack, in an unprecedented act of thuggery, police switched off the electricity to the area where Hakainde’s house is located and plunged the area into total darkness. The police tear gassed and vandalized the house, broke doors and windows, stole whatever they could steal and caused a huge amount of damage to property in the house. They assaulted whomever they came across in the compound and detained all of Mr. Hichilema’s workers. They did all this without a warrant and in complete disregard of the constitutionally protected rights of liberty and protection of property of a Zambian citizen. In a shocking decision, after the end of the siege, the police announced treason charges against Hakainde. Having served as Advisor to the UN in the South African transition period from 1992 to 1994, the behavior of the Zambia police brings to mind the illegal brute force used by the apartheid police to brutalize and pillage black communities in apartheid South Africa in the run up to the 1994 elections. In the face of this shameful police brutality and serious violations of human rights to life and physical security, the Zambian government has remained mute and at times cheered the police on and made alarming statements about the need to fix Hichilema and his supporters. Even more troubling is that this is happening at a time when the government is led by a lawyer who should be well acquainted with the rule of law and the concept of constitutionalism. Zambia finds itself now in a situation where the police force, which should be the upholders of the law, are now agents of fear and intimidation. The primary purpose of the security forces has become to protect the ruling party, and the personal power of the president. Policing skills in investigation, crowd control, protective and preventive action, have been sacrificed in response to the demands of political obedience, extortion and brutality. The rights of people holding contrary views to those of the ruling party are not respected. The decay of law and order under the present Government has been matched by a sharp deterioration in the behavior of the police force, which perpetuates the decline. The political role comes with demands by politicians and the influential to carry out visible crackdowns or arrest specific people. In a context where “quick” and politically defined results are expected and where corruption, obedience, and opportunism are entrenched in the security forces, the torture and humiliation of suspects has become a culture. The Government is legally responsible for the death of Mark Nchimunya Choongwa and for the violation of Mr. Hachilema’s rights and damage to his property by state agents.